Ukrainian troops incurred no casualties in eastern Ukraine yesterday, reported Colonel Oleksandr Motuzyanyk, Ukrainian Ministry of Defense spokesman on ATO, at a press briefing at Ukraine Crisis Media Center. Russia-backed militants made a total of 18 precision attacks on Ukrainian Armed Forces’ positions yesterday. Ukrainian troops returned fire six times using weapons not proscribed under the Minsk agreements. In Luhansk sector, Russia’s proxies made 13 precision attacks. “The enemy conducted long-lasting attacks near Luhanske using 82-mm and 120-mm mortars, having fired 30 rounds. Moreover, Ukrainian troops recorded hostile attacks involving Minsk-proscribed weapons as well as IFV mounted weapons, 23-mm anti-aircraft twin-barreled autocannon, grenade launchers, machine guns, and small arms,” Colonel Motuzyanyk said. Russia-backed militants attacked Ukrainian positions in Novotoshkivske are with 82-mm mortars, near Novooleksandrivka, Novoluhanske, Troitske, Stanytsia Luhanska, and Novozvanivka militants used various grenade launchers and small arms. In Donetsk sector, Russia-backed militants violated the ceasefire five times. Militants fired seven mortar rounds near Vodiane in one hour and fired 10 more near Pavlopil. “The situation was also tense near Verkhniotoretske, Avdiivka, and Krasnohorivka. 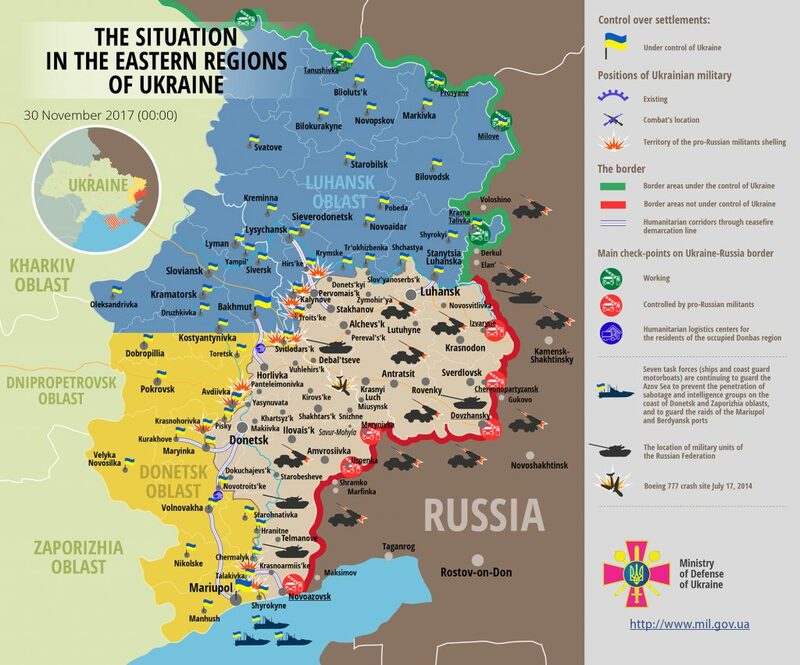 The enemy refrained from using heavy weapons there but employed grenade launchers,” the ATO spokesman added. Report on the military developments as of November 29 is available here. Interactive data on the shelling: chronology shelling chart and the interactive map.